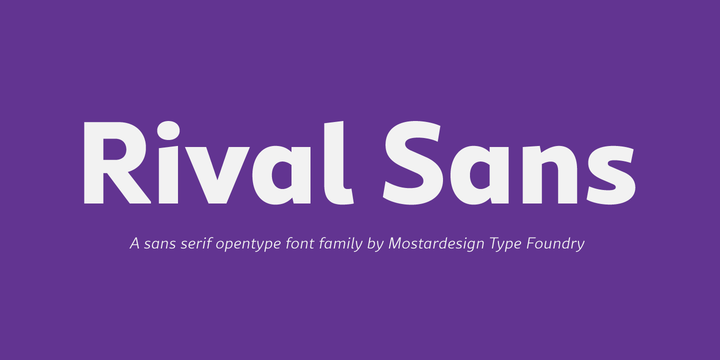 Rival Sans is a modern sans serif typeface created by Olivier Gourvat and published by Mostardesign which is available in 16 styles, 8 weights and italics, a wide range of OpenType features and multilingual support. It is characterized by clen sans serif characters, a versatile readable font ideal for many purposes. It has advanced typographical support but also can be use for webb, apps, ebook, branding etc. Cannot miss it! Price: starting from $25,00 for one font to $199,00 for all 16 fonts. A font description published on Tuesday, September 5th, 2017 in Fonts, Mostardesign, Olivier Gourvat by Alexandra that has 1,890 views.